Repeaters with 1 tick give off 0 ticks in certain conditions. Each design in the image is a comparison between 2 timings. 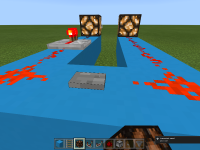 In design A, everything appears to work normally, however when a redstone device, like a piston or lamp (B and C), is attached to the output, they fire simultaneously, regardless of the repeater, or of the delay seen in the redstone dust. A 2 tick delay works perfectly (D), and when a 1 tick difference is produced without a 1 tick repeater (design E uses a 2 and a 3), a 1 tick delay is produced as expected. Therefore, something is wrong with a repeater on 1 tick - it updates redstone dust correctly but not devices attached to that dust.